Let me start out by saying I had the best of intentions--so much great stuff to share with you last week. But it was one of those weeks where so much HAPPENED and yet nothing really happened, you know what I mean? And every time I sat down to write, something or other pulled me away and I'd think, well tomorrow I'll find a free hour or two, but nope, no siree! And then I got the dreaded virus (you know the one that's going around) and have spent the last few days shivering and hacking away. Gee, it's been fun! Anyway, all of this is to explain my MIA status, but I'm back, a little worse for the wear, but back nonetheless, with this amazing recipe for homemade, everyday brioche that practically makes itself!! Even if you've never in your life made bread before, I promise that you can do it! So what exactly is brioche? If you never yet experienced the joy of brioche, it's basically a rich French yeast bread enhanced by butter and eggs, similar in texture to challah. This version is somewhat lightened up in that it only has 6 tablespoons of butter and 2 eggs for two loaves of bread, which means it's light enough to make it a regular thing and not a once in a while indulgence. Which is lucky for us because once you taste this wonderful bread, you're going to want to make this all the time. And you totally can because it's ridiculously easy and foolproof!! After mixing together the dry ingredients, you add the wet ingredients, cover with a damp cloth and let the yeast and other goodies do their thing. No kneading, no rolling, nothing but a couple of hours of rising and then baking. It's like having a French patisserie in your very own home!! The bread is light and airy with a touch of sweetness and a fabulously crunchy crust. It's wonderful on its own or toasted with butter and jam. Makes a mean French toast too! I pretty much make this once a week which everyone kind of made fun of at Thanksgiving, but who cares when we are laughing all the way to the breadbox?!! In truth, ever since we finished our kitchen renovation in May, I've been baking all our bread. Not only is it so much healthier (no preservatives) but it's so much more delicious too (is anything better than the smell of fresh bread baking in your kitchen?) I generally alternate between this brioche we're addicted to and a heartier loaf like Honey Whole Wheat or Andama or Oatmeal Bread--promise to share those soon! Meanwhile, during this holiday season, how great would it be to serve your overnight guests homemade brioche for breakfast? They'll never want to leave! Hmmnn...on second thought maybe you should just buy a loaf of Wonder! Just kidding! Make the bread! I know it's going to become one of your favorites!! Gotta go fumigate my house now!! Wash your hands a lot and stay well everyone!! 1. Place the flour, salt, sugar and yeast in a large bowl and whisk together. In a separate medium bowl mix together the melted butter, water and milk. Add the eggs and whisk well. Pour liquid ingredients into dry and use a rubber spatula to combine the ingredients well so that no traces of flour mixture are visible. Dough will be sticky. 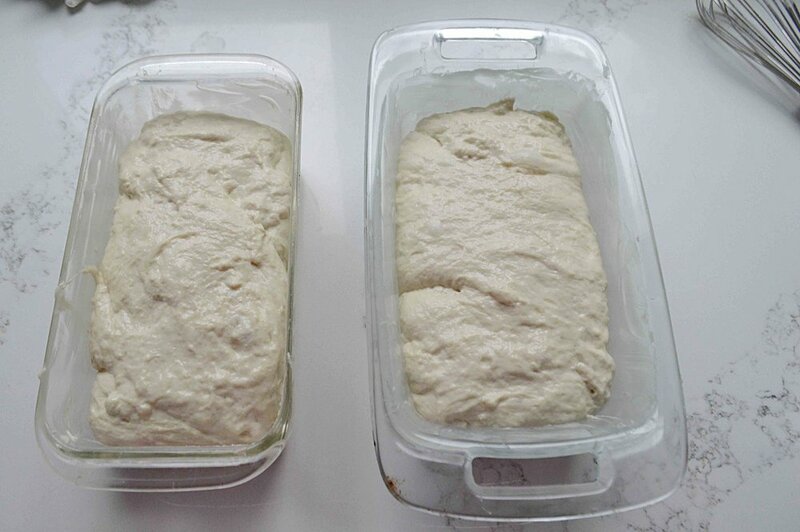 Cover with a damp tea towel or plastic wrap and let dough rise in a warm place for 1 ½- 2 hours until doubled in bulk. Sometimes if my kitchen is cold, I put my oven on a very low setting, like 225º F and set the bowl on top of the oven to help the rising process along. 2. Make sure the rack is centered in the oven and preheat to 375º F. Generously grease two standard loaf pans with the softened butter (I alway use glass ones) and set aside. 3. 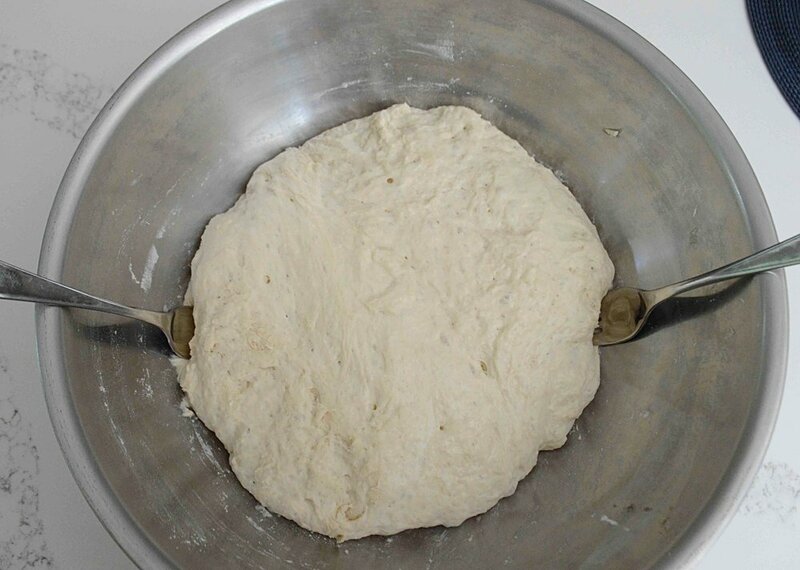 Use 2 forks to deflate the dough by releasing it from the sides of the bowl and pulling it towards the center, turning the bowl as you go. You will have a ball of dough. Then use the forks to divide the dough down the center into two halves. It's ok if it isn't exact. Butter your hands a bit and scoop out each half and place into the prepared pans. Set the pans uncovered in a warm space for about 20 minutes for dough to rise until it just about crowns the rims of the pans. Sometimes when it's cold I have to tack on an extra 15 minutes of rising time. 4. Bake for about 45 minutes, until bread is golden and firm to the touch. Turn the loaves out onto cooling racks and turn them so they are resting on their sides. Let cool for at least 20 minutes before serving. Note: Recipe adapted from Bread Toast Crumbs by Alexandra Stafford.